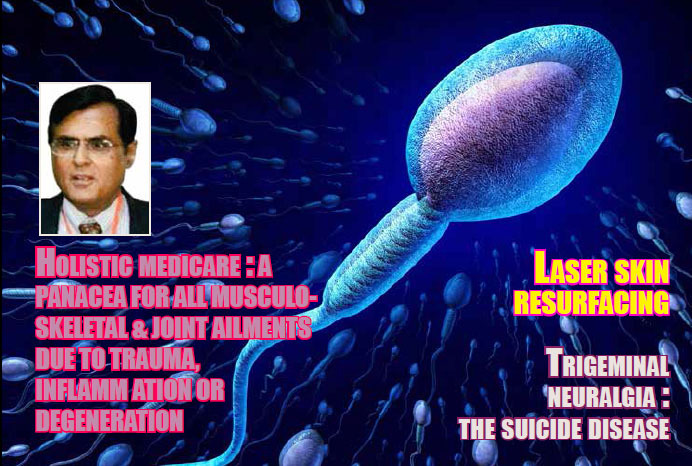 A Panacea For All Musculo-Skeletal & Joint Ailments Due To Trauma, Inflammation Or Degeneration: Dr. R K Tuli - "SOHAM"
restore positive health and total wellness, ‘body-mind-spirit’ in all. Holistic Medicine = Modern Medicine + Traditional Medicine (Allopathic Medicine complemented with drug-free modalities of Alternate Systems of Health. Dr. Tuli presented the remarkable complementary scope of Holistic MediCare by pictorial evidence of a 76 years old Royal Air Force veteran, Mr. F. R. Wilson, who came to him as a ‘cripple’ in miserable drug-resistant pain and wasting of his left lower limb due to inoperable advanced Spinal Degeneration and Severe Arthrosis of Left Hip Joint, as endorsed by following X-ray images: The X-Rays No. 1 & 2 reveal severely advanced degeneration of lower spine and left side pelvis including the hip joint. After commencement of Holistic Medicine therapy, the patient had total relief from pain within 4 weeks. With continued therapy, the affected limb showed significant progressive structural improvement, regeneration and restoration of function over next few months, as supported by images at no.3 and 4, respectively. An orthopedic surgeon commented that this natural recovery and radiological restoration is certainly beyond any expectation, while such reconstruction is not possible anywhere in the world! According to Dr. Tuli, as evidenced by the pictures, Mr. Wilson got relief from his pain within a few days and about six months later he had regained full range of movements in the spine and hip joint. He was a fully rejuvenated to be able to do all yoga asanas, squat freely, and even became an exercise freak to pedal exercise bicycle for 30(!) kms a day. He truly resumed to ‘Live Life Fully’ with jest greater than any 18 years old. The 35 years old patient suffering from Severe Low Backache, radiating down the Left Lower Limb developed weakness to be unable to walk, or stand due to numbness in the lower limb and foot drop for the previous six months. He was advised urgent decompression surgery by all spinal and neurosurgeons. But, he was reluctant to undergo surgery as no surgeon could assure him for complete recovery from pain, numbness and foot drop. He commenced treatment w.e.f. 13th October 2009, and started showing subjective clinical improvement just after the first week, and felt full restoration of strength , mobility, sensation, and function of his whole limb. The repeat MRI on 14.1.2010 revealed natural decompression commensurating with patient’s full and complete recovery. Ms. Chhaya Adak, had represented India in Weight Lifting at several international meets and turned a national coach after retirement from active sport. She states, “I came to Dr. Tuli in year 1992 for treatment of my pain and chronic injuries in almost all the joints of my body and spine, accumulated over the years as a result of my sport. Following her achievements in international forums, Chhaya Adak received the coveted ARJUNA AWARD from President of India in year 1995, and rewarded with the job of Assistant Commandant in CISF. Dr. Tuli highlighted that it’s perhaps unique in the history of world’s sport that a retired sportsperson, turned coach, bounces back into active sport and achieves heights never attained before. There are a few more sportsmen who have brought glory to the nation in the form of medals at international meets, received Arjuna Awards and other accolades following his support. The list includes the only Asian gold medalist in golf, hockey players Dhanraj Pillai, Dilip Tirkey, Gagan Ajit Singh, Deepak Thakur, and Prabhjot Singh, etc. To name a few cricketers, he informed that Allwyn Kallicharan of West Indies and Manoj Prabhakar are the famous beneficiaries of his treatment; besides Nikhil Chopra, Rahul Sanghvi and Murali Karthik could play for India only subsequent to successful therapy of their respective ailments with him. Dr. Tuli has, been, himself an international mountaineer of significance. He was instrumental to conquer a virgin peak along with a Japanese team in the Lahaul-Spiti region of Himalayas which was named, after his then fiancée, Mt. Poonam in year 1973. He has been Medical Adviser to Air Force Sports Control Board and the Indian Hockey Federation. CONCLUSION: It’s revealing that this holistic model of health based on non-medical or surgical interventions offers excellent and lasting curative rates, often beyond the best of conventional medicine worldwide, with lasting rehabilitation of various inflammatory, degenerative, or traumatic musculoskeletal, joints and spinal ailments. It, also, helps recovery from sports injuries in quickest possible time; in most cases restoring health capabilities even much better than the best of the same person ever before. Large scale studies shall further establish complementary role of Holistic Medicare in improved post-surgical rehabilitation of patients, and also a healthy scope for those who need a major surgical correction but are medically not fit due to systemic ailments; as well as those whose outcome after surgery has not been satisfactory or rehabilitation is inadequate.